Breakfast. They say it is the most important meal of the day. Some people love it. Some people loathe it. Some people even have breakfast for dinner. I have distinct memories of breakfast growing up on suburban Long Island. Of course, the Barritt Boys all craved sugary cereals on weekdays. It was the 1960s, after all. One of our favorites, “Sugar Pops,” has now been reformed and renamed “Corn Pops” in a nod to better health and political correctness. On Sunday morning, when all six of us were busy getting ready for church services, we’d gulp down Carnation Instant Breakfast (preferably chocolate) to save time, and now and then we’d have pre-sliced frozen toaster bagels as a special treat before most of the world knew that fresh bagels were an option. On an occasional Sunday evening, Dad would fire up the electric frying pan and pile up stacks of fluffy pancakes with maple syrup and melted margarine. There are intriguing cultural associations to the types of food with which we start our day. 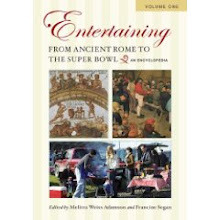 Larousse Gastronomic says history offers two very different breakfast traditions – a hot drink, or a more substantive meal. In France, the hot drink can be café au lait often accompanied by bread. Before coffee was popular in Europe, that first drink of the day was often soup. Spain had a salt cod soup tradition and in Poland, one might find that “first drink” soup made with beer. The British started the morning with beer with bread. Jolly good! The more substantial traditional English breakfast of eggs and bacon has lots of regional variations heavy on protein, which might include grilled kidneys, smoked fish or black pudding. Slow cooked oat “porridge” comes from the Scottish breakfast tradition, but Larousse Gastronomic points out that quick breakfast cereal is a modern invention, initially intended as health food. Dr. John Kellogg invented corn flakes at his clinic in Battle Creek, Michigan and a cereal dynasty was born. Dr. Max Bircher-Benner, dreamed up muesli – a mixture of raw fruit, nuts and oats – at his Zurich clinic. When the weather cools, my morning thoughts turn to homemade granola. 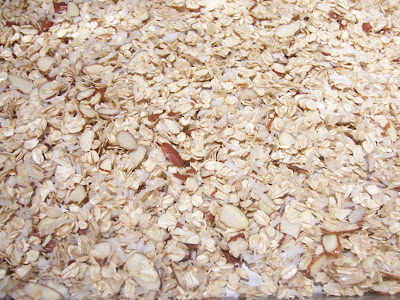 Fresh grains, and nuts are tossed together and baked, and the kitchen smells of toasted nuts, coconut and warm honey. Chopped dried fruit is added when the mixture cools. 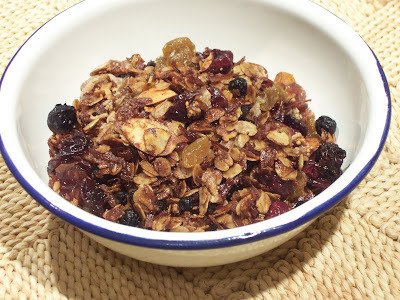 Granola is a baked version of the original muesli and my favorite recipe is a variation of one found in “The Barefoot Contessa Cookbook” by Ina Garten. For anyone who is a baker, you’re likely to have many of the ingredients left from a recent muffin, cake or cookie project, so it’s a nice strategy for quickly using up those bits of ingredients left in the pantry. The recipe has infinite variations, limited only by the imagination. My late summer addition is dried blueberries. Combine dry ingredients in a large bowl. Wisk together the honey and oil and toss with the dried ingredients. Spread on a large cookie sheet and bake at 350 degrees for 45 minutes, tossing several times so the granola browns evenly. Go ahead and get crunchy tomorrow morning. It’ll put a smile on your face and it’s a heck of a lot more appealing than a bowl of hot soup! For some reason, I never make granola in summer, though one of my favorite ways to eat it is with cottage cheese, all mixed together, and that's a great summer breakfast. I like adding dried fruit too, especially dried cherries -- and raisins, of course. 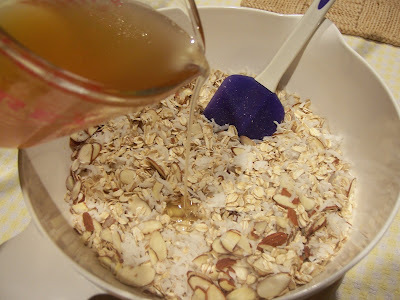 I add a little molasses to my granola... yours looks yummy! I like it with Greek Yogurt. I've never made granola before. This looks crunchily delicious. And I can't function without breakfast - it's an important part of the day. 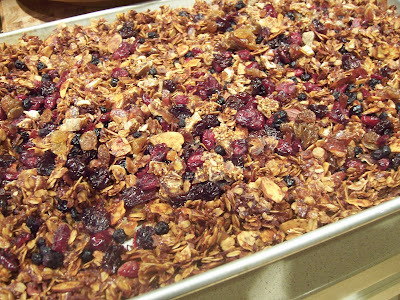 Lydia - I always go for granola in the fall. Sandi - I have just become a convert to Greek yogurt. It is sooo good! Veron - If I weren't such a fan of cakes and tarts, I would say that breakfast is my favorite meal! My brother Chris would have loved having breakfast at your house. He loved Sugar Pops/Corn Pops! And I love your granola, especially with the dried fruit medley. It's perfect fall fare. Susan, all those different dried fruits create a flavor like no other!